The after tour blues are setting in, the 2014 Euro Bus Tour has flown by and now, now what…?! All of our bags are half un-packed; sleeping bags still smelling of Croatian sea salt air, and most likely towels and swimsuits still sitting in a wet-bag somewhere in the room. Our memories are still vivid and fresh, the sweetness of early morning rising still lingering on our minds, but everyone is now in their respective countries and we are again all alone! Or are we…? Please take your photographs and keepsakes and place them on the wall, but always remember that there is someone always with you all the time – Krishna!! Applications for Summer 2015 Euro Bus Tour will open in December. Please keep updated by liking us on Facebook: Euro Bus Tour. Please email eurobustourorganizers@gmail.com for any inquires. Transform, Enrich, Inspire Your Summer Euro Bus Tour Strikes Again! Ah, summer… that time of the year when most of us go to far-off places and enjoy mother nature, relax and take it easy, and fuel up for the rest of the year’s work/school commitments. Although this break is completely needed for a work-life balance, what about your Krishna consciousness fuel needs – where does KC fit? More than 15 years ago second generation devotees and ISKCON Youth Minister Manorama das and wife Jaya Sri Radhe dasi decided to blend these two fruitful ingredients: summer fun and KC for a delightful smoothie called the “Krishna Youth Culture Festival” aka “Bus Tour” whose success with ISKCON youth is untold. 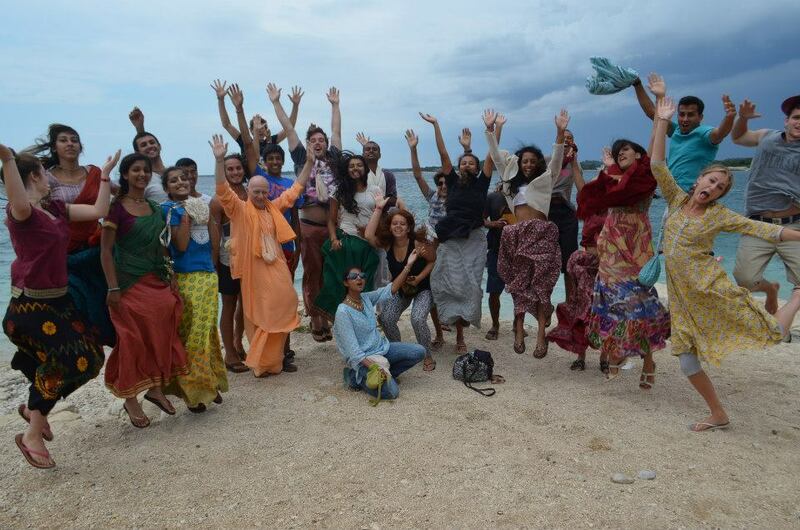 This past July 10 – August 11, 29 youth plus, one Vaisnava bus driver, toured Southern Europe making stops at temples, doing maha-harinams, sightseeing in cities, adventure activities, kirtans, and joining festivals in seven countries along the Mediterranean coast. Although the bus was smaller than anticipated and the weather not always as comfortable as expected, the hospitality, generosity and care that we received from the many temples was enough to keep everyone satisfied. There was excellent prasad in almost every Italian temple and Govinda’s visited, there was kirtan, kirtan and more kirtan during every second available on the bus, on the streets, during mealtimes, and the late night hours. As a young couple, my husband and I felt unsure if we could handle the task of running the European version, the “Euro Bus Tour” on our very own; would the participants be inspired by us (as well as listen to us!)? Would we buckle under the various forces of pressure? Could we make them feel cared for and still keep our sanity? Would we be able to stay in our self-made budget? Although the anxieties were real, the strength and assistance came to our core leader’s group: Kumari Kunti dasi, Visvambar Caitanya das, Sharanagati dasi, and Sandipani Muni das; who are all second-generation youth living in London, at their different times of need. All who joined us, including ourselves, found a newfound love or at least satisfaction with austerity, a further understanding of what surrender to Sri Krishna means, and a deeper taste for devotee association and sanga.